South Korea’s two major conglomerates Hyosung Group and Kolon Group have expanded investment in China early this year despite widespread retaliation against Korean businesses and goods in the world’s second largest economy due to Korea’s deployment of United States’ Terminal High Altitude Area Defense (THAAD) antimissile system. According to Financial Supervisory Service data on Friday, Korea’s leading chemical and textile company Hyosung in the first three months of this year has invested 327.4 billion won ($292 million) in its businesses in China, nearly 80 percent of its total investment of 410.8 billion won over the same period. Four out of seven new projects have been initiated in China, data showed. 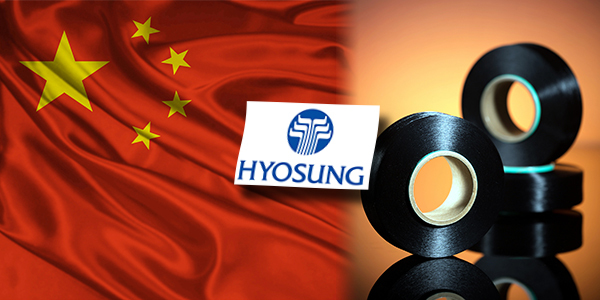 Hyosung is currently building a spandex manufacturing plant in Quzhou, a state-level-city in Zhejiang Province, at a cost of 104 billion won to meet fast growing demand for spandex in China where 25 percent of total spandex production is consumed. Hyosung has also spent 79.3 billion won to build a facility producing nitron fluorine three (NF3), a special cleansing gas used during the manufacturing process of semiconductors. Demand for NF3 has been surging in China on the local government’s efforts to nurture the chip industry. It has also invested 67.2 billion won in building an airbag production facility and plans to invest 77.7 billion won to expand its nylon film facility. Nylon film is used as a material to pack cold and frozen groceries. Another Korean conglomerate Kolon Group that owns a wide range of businesses from fashion and chemical to engineering and energy has not restrained from expanding its business in China, either. In February, its fashion unit set up a joint venture in Hong Kong with China’s largest sportswear company ANTA to tap into the burgeoning outdoor wear market in China where the number of young people enjoying sports leisure activities has been on the rise. In a move to seek new revenue sources, Kolon has shifted its focus to China from Korea where the outdoor wear market has saturated. Its industrial materials unit is also reported to be mulling adding its second airbag factory in Jurong, a city in Jiangsu Province. The two Korean conglomerates’ decision to up investment in China came despite growing hospitality against Korean companies amid the ongoing diplomatic row between the two neighboring nations following the Korean government’s decision to host the U.S. antimissile system on its soil. Against the antimissile system deployment, the Chinese government has taken a slew of retaliatory actions against Korean businesses in China and Chinese consumers have boycotted Korean goods.